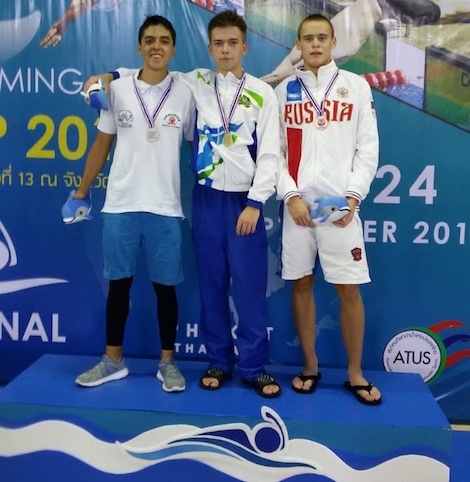 October 3, 2018: athletes representing the Taganrog Specialized School #13 for Olympic trainees participated in the golden final of the XIII Finswimming World Cup 2018, held September 20-25, 2018 by the World Underwater Federation (CMAS) in Phuket, Thailand. Among participants from Taganrog who took prizes are Dmitrii Adalin (coach Olga Zadorozhnyaya) and Artyom Zhivtsov (coach Igor Saprykin). Dmitrii Adalin won three gold medals - in the categories 50 meters SF (SwimFins) boys, 100 meters SF boys and 50 meters diving. Artyom Zhivtsov won the bronze medal in the category 100 meters IM (immersion) boys. Athletes from Taganrog made a great contribution into medal count for the of Team Russia, which finished first in the overall medal standings, leaving behind Peoples' Republic of China and Ukraine.